Your flooring type, wooden floors require less rigidity from a mat than a carpeted home. Non-absorbance, ensuring that your mat can be wiped clean easily. Fold away design, useful if you travel frequently or will use it in different locations. It’s also important your mat shouldn’t trip you or your toddler up during use. Many come in circular designs, which is what we would recommend every time from a safety point of view. 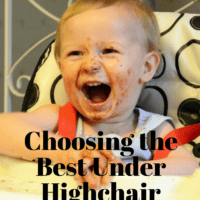 Whatever you’re looking for in a high chair mat, we’ve listed the top choices for parents everywhere, making sure you know what the plus and minus points are for each one. This high chair mat ticks all the boxes for use. It’s round in design, easily cleanable and folds away for parents to transport. It’s 47.5 centimeters in diameter, making it suitable for most high chair models, (Measure your high chair base to make sure) plus it’s suitable for both carpet and wooden floors too. During our use, we were impressed how well it took to both wooden and carpet floor, yet we were disappointed with the vinyl covering, which may not stand up well to daily use. However, we’ve yet to discover any online reviews that mention the quality of the fabric used, so our fears could be completely unfounded. We had no problems with the easily wipeable design. It was easy to clean food off after each mealtime, a damp cloth is all it took. 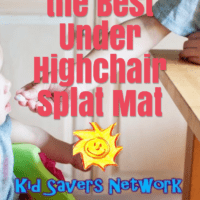 Overall we thought this under highchair mat was perfectly acceptable given the price. The KidKusion mat is a lovely design, featuring a rather nice giraffe picture on the front. It measures 36 by 48 and the cover is waterproof and wipe clean, as you would expect. This splash mat is also foldable, making it easy to store and carry with you on the road. When testing this mat, we found the base not quite as straight as you would expect. It did have one or two slight ripples in the PVC fabric, although these didn’t cause any issues. The PVC fabric was easily cleanable with a soapy cloth, whilst the price is truly amazing, something all parents should appreciate. We felt the KidKusion base was nice and thick (Possibly why it had ripples) which should prove quite strong and sturdy during daily use. We love the KidKusion design and think it makes a lovely addition to any modern playroom or home. It’s good quality and well priced for the way it looks. e Bumkins high chair mat features a striking Disney-inspired design, coupled with strong polyester construction, a first for our reviews. Being of lightweight polyester manufacture, it’s easily foldable and doesn’t suffer from any of the ripple issues we had with the KidKusion model. It’s also wipeable and can be sponged down with ease. One issue we thought we would have, was usage on a carpet. We wondered if polyester would prove a good mat base for softer flooring, yet our worries were misplaced. The little Bumkin matt proved a good base regardless of the under-flooring. Overall, we think that it makes a good baby travel mat and the price is absolutely amazing. Not just for under a high chair mat, the Magic Mat is strong, sturdy and also suitable for use as general purpose play area. Whilst it’s made of PVC we checked to ensure it’s free of BPA and other nasties. The surface is easily cleanable, requiring a little washing up liquid to remove tough pieces of dirt. We did find the PVC fabric used was a little bit tougher to clean than most. Perhaps it’s because of the “grain” of the fabric, we’re unsure but it was noticeable. 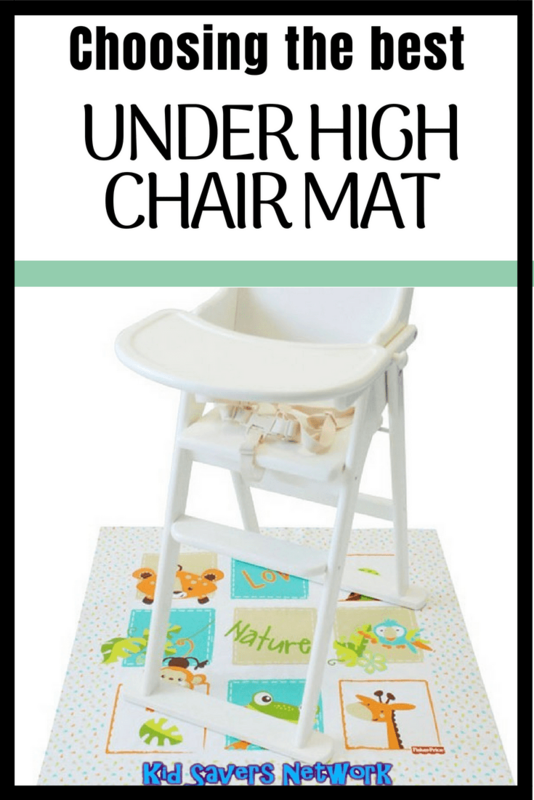 As a play mat, it has a nice foam interior which provides a safe and supportive surface for high chairs. 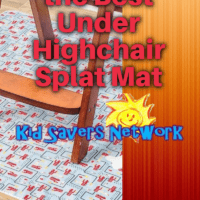 We found it easily usable on both wooden or carpet floors, while it proves a comfortable base for child play. This product is double the price of some of the strictly “Baby Splat Mats”. This could be a sticking point for most parents (no pun intended!). However, you’d have to factor in that you’d actually use this one more. This was also the only one on our list that had a small amount of padding, too. You can click here to check out today’s price. sheep with numbers on their bodies, which looks really cute and should fit into a play room nicely. The fabric used is laminated canvas, which is fully machine washable and easy to sponge or wipe clean. It’s also touted as the perfect picnic canvas, a function we can see being performed admirably due to the easy folding and stow-ability. 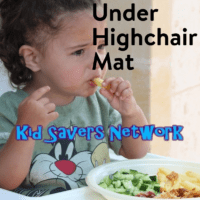 As a mat for under a high chair, it’s strong and should be fine for carpet or hard floor use. It really provide a nice surface for playing on. 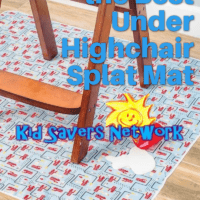 When testing this mat, we found the Sugar Booger easy to use, stow away and it generally brightened up our play room. It’s easy to wash and even if it does become soiled, we machine washed it easily. One top tip, although this product can be machine washed – please don’t be tempted to tumble dry it! We’ve heard reviews where the mat shrunk considerably after tumbling drying. Leaving it out to dry for an hour before use is your best bet. You can find the Super Booger for sale on Amazon.